Whew, the first five days of my April style sudoku flew by! As I did with my January style sudoku, I’m grouping the outfits into three different posts. 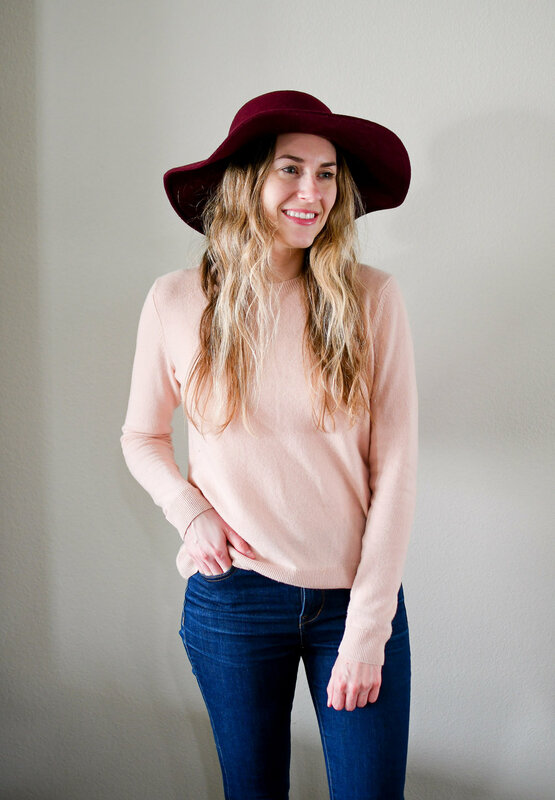 Below you’ll find all the details on what I wore on each day, the weather for that day, and my thoughts on each outfit and how well it worked for me. We flew back from Portland early on Sunday, and later in the day we had dinner plans since my mom and step dad were in town for the weekend. I didn’t have my full sudoku put together so I spent a good portion of the afternoon trying to figure it out and most of it was kind of just thrown together. I wore this outfit knowing that I would at least include these four items just in case I needed to change anything. The rain returned, so I broke out the first of three outfits featuring my Hunter boots. I included the same boots in my winter sudoku. Really hoping I won’t need them in the summer, too, ha! It was another warm day, though most of my day was spent indoors working. The shirt felt a little fussy under the sweater blazer; I couldn’t get the sleeve cuffs to lay quite right over the blazer sleeves. I definitely prefer wearing the shirt sleeves at full length with no cuffs. The “unstainable” fabric is a little too slippery to hold folds in place (which is nice, because it resists wrinkling!). We had a 90% chance of rain, so I opted to wear my second of three outfits with my rain boots…and it turned out that it didn’t rain all that much, so that was pretty much a waste, unfortunately. This weekend and next week could be rainy again. Oops! It’s tough to know what the forecast will be two weeks in advance. I also probably shouldn’t have worn an outfit with the hat since it was windy later in the day! Double whammy, haha. I will say that I got compliments on my hat at work, and it was then that I realized that I don’t think I’ve actually worn any of my floppy hats to work. I’m not opposed to wearing hats indoors but floppy hats feel sillier than regular baseball caps so I hadn’t done it until now! Wednesday looked to be mostly dry so I took a chance and wore my kitty flats! I love juxtaposing them against my boyfriend jeans. 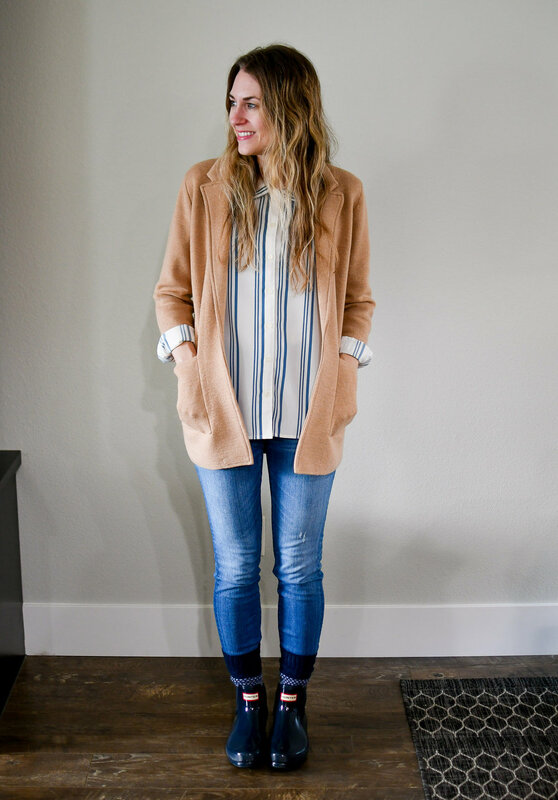 I liked the contrast of the navy striped tee against the light camel sweater blazer, but I’m not a huge fan of the sweater blazer–boyfriend jean combination. I think I would like pairing a regular blazer with boyfriend jeans more than the more loose-fitting sweater blazer. It still was a nice, comfortable outfit for a day at my desk. I opted to go with another shoe option besides my Hunter boots since I really didn’t think it would be that rainy, and much to my chagrin, it rained more on Thursday than it did on Tuesday. Sigh. Gotta love spring weather! I wore my navy blazer for the first time in way too long. I really do like having it for when I need to look more professional at work, but that doesn’t happen often if at all so I just haven’t worn it. It’s also snugger on my shoulders than I remember it being. I wish J.Crew still made this exact blazer—gold buttons and all! It’s such a classic. I left the shirt untucked during the day but now that I’m looking at the photos, I wish I would have tried front tucking or half tucking it. It’s a little long under the blazer.